About: Amadi Chemist is a dispensing chemist that sells a range of toiletries. They also provide an off-site film processing service. Ken is a brilliant, knows all.his patients by name and knows what prescription he is giving to you - he also gives out great advice . Ken is so very helpful on the phone and in person! Pharmacies don't get much better than this tbh! Ken and Sarah are always courteous and go out of their way to help their customers. Would deffo recommend. will do anything he can to give you help and advice. is lovely recommend to anyone!!!!! They deliver tablets to my mum, an invaluable service which has lifted a weight off my shoulders. Ken and zara are delightful people very rare to find these days. A wonderful gem of a place. Personal service, with a smile. 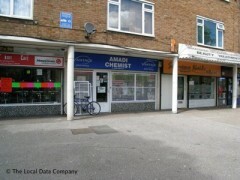 Amadi chemist is a wonderful place to go for your drugs. Ken takes time and patience to attend to his customers and always gives them the right advise and medication. I would like to agree with the other reviewer. My doctor also recommended this pharmacist. Ken took time to ensure he ordered in exactly the right medication and dose, for which there were a confusing amount of options. His service was friendly and very efficient. I would highly recommend him. My doctor recommended I come here after I had too many bad experiences with another pharmacy. I'm so glad I found this place! The pharmacist Ken is such a lovely person. He welcomes everyone into the shop by name, he's always helpful and courteous, he makes sure you know what each prescription is and how to take it and he double checks all of the important details to make sure you are getting what you are supposed to be getting. He always takes the time to talk to his customers and answer any questions they may have. My doctor was right - he's the best, most professional pharmacist I have ever met and I won't go anywhere else from now on!